In 2007 the economist Panu Kalmi published a review of economics textbooks used in the University of Helsinki from 1905 to 2005. The author found that co-operatives had a greater presence in books published before WWII than in the post-WWII era. His theory was that due to the changing role of economy (from serving people to being served by people) and the growing popularity of top-down, private or individual solutions to societal problems, co-operatives were disappearing from textbooks as they no longer seemed to represent a valid and valuable alternative, or in other terms, they were considered to lack competitive advantage. The author predicted that his findings were likely to be similar in other European countries, too. A few years later, a study by Co-operatives UK identified a similar problem in business start-up hubs: business advisors were omitting co-operatives from their set of business model alternatives when advising those who were thinking of setting up their own enterprises just because they ignored or did not value the co-operative model. In an attempt to solve this issue Co-operatives UK launched a three-year project in July 2013 called The Co-operative Option to offer resources, training and information on the co-operative model to business advisers with the hope they would share this alternative option with their advisees. The Rural Urban Synthesis Society (RUSS), based in South East London, is a remarkable example of this alternative option: a member-led Community Land Trust (CLT) that was set up for the benefit of the local community. Last summer after more than four years of campaign work, RUSS went through a demanding procurement process to put forward a community-led proposal to develop a council-owned vacant plot in Church Grove, Ladywell. In October 2015, London Borough of Lewisham announced that RUSS was the preferred bidder to develop the site. With access to land, RUSS is now seeking to secure development funds and planning permission to deliver its sustainable and affordable community self-build vision. The self-build aspect of the project will not only reduce costs and increase affordability, but also provide training opportunities to self-builders and volunteers, while aiming to encourage teamwork and cohesion during the building process. RUSS and other CLTs are aiming to make housing affordable, but also greener living affordable, a virtuous cycle that self-reproduces: better insulated homes that save and produce energy lower members’ living costs and their environmental footprint. RUSS was originally formed back in 2009 with only a handful of members; today, it has more than 250 members. The organisation’s co-operative advantage has been noticed by numerous individuals, the local government and established civil society groups, such as London Citizens. But what does the concept of co-operative advantage actually mean? The term has been popularised over the last few decades as a friendly version of the economic theories of comparative advantage and competitive advantage, which aim to explain financial gains for organisations that operate in more efficient ways than their competitors. Comparative advantages emerge in relatively open markets and are materialised into greater sales, margins and/or higher degrees of customer retention in comparison to those of the competition. In this economic sense, the co-operative advantage is where the co-operative model has an “edge” or a “fit” that offers a competitive advantage over private sector businesses. Much has been written about the extra advantages that the co-operative model brings to the table. The obvious one is a co-operative’s edge in meeting needs not met by the private market, since co-operatives are bottom-up initiatives created by the same people who suffer those needs. Membership in some cases may offer advantages that are not available otherwise, such as a job, access to otherwise prohibitive facilities and services (e.g. in farming), or access to shared spaces or housing as in the case of RUSS and other community land trusts. The CLT model was originally popularised in the US and later appeared in Britain’s rural areas first. In the UK there are currently many rural CLTs and more urban ones are gradually emerging, such as Bristol CLT and in London, Brixton Green and East London CLT. This data provides co-operatives with extra market knowledge that other private companies are unable to capture. However, the problem with this ‘advantage’ approach is that co-operatives’ performance is always studied in comparison to those of privately owned firms and in a context of competition, not co-operation. The success of a co-operative is far too often measured with the same short-sighted yardsticks used to quantify efficiency and cost effectiveness in privately owned companies. The co-operative advantage initially appeared as a response from co-operative advocates to counterbalance the numerous books and academic articles from economists who were analysing the limitations of co-operative’s financial performance and governance and to show that co-operatives can also have a competitive advantage and a business case. CLTs are moving away from these reductionist definitions of competitive advantage and success. CLTs are owned and run by members as not-for-profit to develop permanently affordable housing and other community assets for long-term community benefit, restricting market forces and creating mutual home options at affordable levels. By retaining total or partial control over the land, CLTs are able to secure affordability and community ownership in perpetuity. CLTs are creating co-operative advantages that materialise throughout the whole process of the formation, development, delivery and management of their projects, going beyond the type of competitive advantage that is only translated in the bottom line of balance sheets at the completion of business transactions. In the case of RUSS, the work of volunteers has been vital to its success. 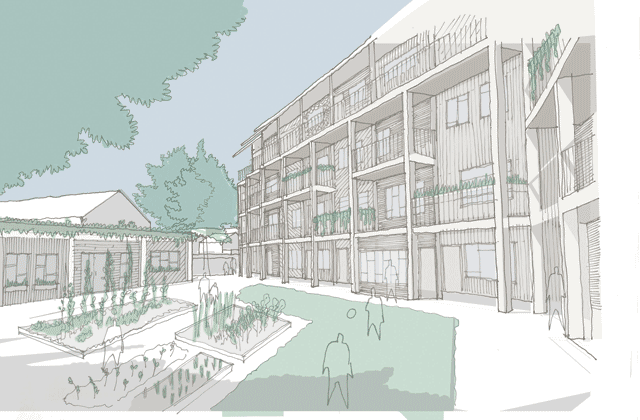 The Greater London Authority awarded RUSS a grant in November 2014 to produce an official proposal and planning application for the Church Grove site. With that funding, RUSS recruited a project manager—RUSS’s only paid employee—along with the newly appointed architectural team in spring 2015. All the work that took place since 2009 was carried out by volunteer members and supporters, who continue to be central to the project and work closely with the project team to move RUSS’s vision forward. It was volunteers who learned about the CLT model, raised funds, joined new networks of like-minded organisations, visited other CLTs, learned about sustainable architecture, explored unsustainable urban lifestyles and how to change them, organised local events to keep the membership growing and inspired and excited many minds on the way. It is volunteers who keep doing all of those things and are working to develop the next stage of the project. The CLT model was originally popularised in the US and later appeared in Britain’s rural areas first. In the UK there are currently many rural CLTs and more urban ones are gradually emerging, such as Bristol CLT and in London, Brixton Green and East London CLT. RUSS offers a very innovative model, not only for a London location that is characterised by its lack of plots and the wider housing crisis, but also because it combines affordability and sustainability objectives through a self-build and mixed tenure approach. By approaching housing collectively, self-builders will be able to access sustainable technologies most individual households could not afford by themselves. A win-win for residents and the planet. Unlike commercial developers, RUSS is also thinking about the spaces in between buildings—such as river paths, food growing and community shared spaces—and how these spaces can foster relationships among residents and neighbours. This collective approach to sustainability and space opens up choices to people at a time where the mantra seems to be that there are no options, especially with regards to housing, and especially with regards to housing in London. For these reasons, RUSS is materialising the co-operative advantage beyond any comparisons and profit margins. This is tangible at two levels: RUSS aims for the synthesis, not competition between rural and urban spaces and lifestyles. Secondly, RUSS is acting as an effective link between bottom-up and top-down initiatives, avoiding infertile competition; unfortunately, far too often, community-led initiatives get nowhere due to lack of resources and unsupportive policies. Top-down initiatives imposed by governments to improve housing or foster sustainable living are often out of touch with the needs of local people. CLTs, alternatively, offer a channel for communities to find common objectives and opportunities in partnership with their local council. Organised at nationwide level by the National CLT Network, CLTs have the ability to lobby for new development policies and more community-focussed policy frameworks that can enable local authorities to foster rather than hinder community-led initiatives. There are obviously good reasons for championing the co-operative advantage but one that goes beyond the ruthless focus on economic growth. However, let’s not forget that despite the commons spirit underlying CLTs, their visions are still dependent on being effective at competing for land and often on open market borrowing. For this reason, RUSS (and all CLTs) should constantly interrogate their options, search for ethical mortgage providers, encourage members to manage their new housing spaces and minimise delegation to professional management decisions in order to continue to have a meaningful and incomparable co-operative advantage. Let’s always ask advantages, yes, but to whom and of what kind? To the organisation? For financial indicators that ignore other social gains? To members? To their communities and the environment? So should we talk of a co-operative advantage? Yes, but not in the sense of simplistic comparisons of economic performance and short-termism, but throughout the whole organisational process and dynamics, creating wealth beyond economic indicators and securing affordability and community ownership in perpetuity; putting a strong, diverse and inspired movement back into the co-operative and moving away from the productivist focus of commercial developers and dominant building regimes for whom people and the environment are not priorities. Let’s create incomparable advantages and immeasurable benefits for people and the environment. Raquel Ajates Gonzalez is a member and former co-director of RUSS.